A RIVER OF PASSION – VIENNA- BUDAPEST – CRYSTAL MOZART – *AUGUST 17 – 24 , 2019. A steadfast commitment to excellence that has earned them unprecedented recognition as the World’s Best for an incredible 21 years; an accomplishment unmatched by any other cruise line, hotel or resort anywhere in the world. The All-Inclusive Crystal Experience is a heady combination of indulgent services and enriching discovery, carefully balancing onboard enrichment and shore side adventure to create the most magnificent luxury experience at-sea. Vienna is the federal capital and largest city located in northeastern Austria. Art and culture have a long tradition in Vienna, including theatre, opera, classical music, and fine arts. The Burgtheater is considered one of the best theatres in the German-speaking world alongside its branch, the Akademietheatre. Vienna has an oceanic climate bordering a humid subtropical climate, that possesses many parks, including the Schlosspark at Schloss Belvedere (home to the Vienna Botanic Gardens). Vienna’s principal park is the Prater which is home to the Riesenrad, a Ferris wheel, and Kugelmugel, a micronation the shape of a sphere. Aside from the natural beauty, Vienna is one of the few remaining world capital cities with its own vineyards – but the community of food & wine doesn’t stop the tourists from visiting their famous Schonbrunn Palace, and Tiergarten Schonbrunn (worlds oldest zoo). ‘Krems’ as its known to its friends, marks the beginning of the Wachau and is the prettiest of the larger towns on the Danube. Enjoyable eating and drinking, an atmospheric historical centre, rivers the top-quality wine from local vineyards and a couple of unexpected museums attract the summer tourist crowds, but the rest of the year things can be quiet. Aimless wandering is the best plan of attack, dipping into churches and museums, strolling the banks of the Danube and sampling the local whites as you go. Spitz is a market town in the district of Krems-land in the Austrian state of Lower Austria, this small village of Spitz ranks among the prettiest villages of the Wachau and is certainly the one with the funniest name. “Spitz” means “pointy”, a word that is also used in German for “horny” with the same metaphorical value. It can be quite touristy during the summer season, there are you usual attractions: the smooth hills surrounding the area, the vineyards, cobbled streets, and Baroque houses. The heart of Spitz includes the main square and parish church. Linz on the Danube is the city that constantly changing. With tourism for all ages, this town is truly one of a kind. With its impressive transformation in recent years, not only are the residents open to new ideas; the city as a whole is undergoing lasting changes as well. Visitors will gasp at the beautiful views from Postilingberg hill and the Hohenrausch. While experiencing history at the same time. Being at the center of Europe, the Danube is the main tourism and transport connection that runs through the city. Linz has now become home to a vibrant music and arts scene that is well funded by the city and the state of Upper Austria – which attracts and maintains the younger generation. Melk is located on the banks of the River Danube, Melk is a picturesque city with a rich history in lower Austria’s Wachau valley. The focal point of the town is the magnificent Baroque structure standing proudly on top of a rocky hill, it’s named as a UNESCO world cultural heritage site. This town you will constantly find yourself in the heart of nature. It’s a charming place for a walking in the spring, summer, or autumn – densely packed with shady forests, vineyards, glittering brooks, and all framed by a backdrop of jagged mountains. Bratislava doesn’t provoke admiring swoons; it intrigues. In the midst of Slovakia’s capital, a flying saucer hovers above forest-fringed riverbanks. Its castle presides over a pastel-hued old town, but a concrete jungle looms behind. Despite the march of modernism, Bratislava is green. It banks the Danube River, by the Austrian border, and its hilly parks are threaded with hiking and biking trails. The Male Karpaty (Small Carpathians) roll north, with vineyards in their lowlands. Bratislava is a frenetic mix of wild and urban, classic and contemporary. Its preserved spires and squares from its 18th-century heyday, but now socialist-era monuments have joined the party. The nightlife is crowd-pleasing whether you prefer beer halls, rooftop cocktails or stag-party mayhem. In a city this exciting, who needs postcard pretty? Hungary is lakeside serenity, fairy-tale castles, and grandeur on the Danube. With stunning architecture, vital folk art, thermal spars, and Europes most exciting capital after dark are Hungary’s major draws. The scene is more gentle then striking, but you cants say the same thing about the built environment across the land. Architecturally Hungary is a treasure trove, with everything from Roman ruins and medieval townhouses to baroque churches, neoclassical public buildings and art nouveau bathhouses and schools. Hungarians have been ‘taking the waters’ supplied by an estimated 300 thermal springs since togas we all the rage and Aquincum was a Big Smoke. They still do- for therapeutic, medicinal and recreational purposes. When the locals arn’t relaxing the food remains the most sophisticated style of cooking in Eastern Europe. They take extreme pride in their nation’s world-renowned wines – from the big-bodied reds of Eger and Villany and white olaszrizling from Badacsony to honey-sweet Tokaj. Whatever you are looking for, you can be sure to find it, in the most authentic way while visiting Hungary. 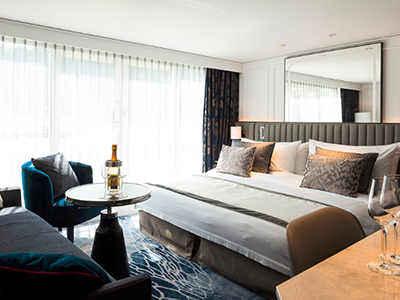 The award-winning Crystal Mozart, Queen of the Danube, is the most spacious of any European river ship, featuring the most expansive, beautifully designed suites; full wrap-around promenade deck; unique social spaces, including a dedicated cigar lounge and the first pop-up bar in river cruising; and an unrivaled standard of state-of-the-art design and amenities. 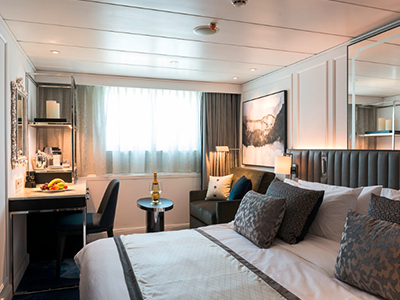 All Staterooms will have a one-time additional charge of $350.00 p/p per Stateroom (Not included in the cruise rates listed above). This charge will be added to your final payment. This surcharge covers: Port charges, taxes, document fees, gratuities, administration & security fees. Taking its name from the popular observation lounges on Crystal’s ocean ships, the elegant Palm Court, is our main social venue. Here you’ll be treated to live entertainment centered around a stunning Bosendorfer piano, one of the finest in the world. In addition to performances led by our onboard Entertainment Host, Palm Court features top-caliber local entertainers, jazz-trios, sopranos and more. Palm Court is a wonderful venue in which to sit back and take in the magnificent vistas of the river while sipping on a delicious cocktail or fine wine served by our friendly bartenders at the bar. Complete with an outdoor television, Vista Bar is the perfect spot for a refreshing beverage or one of our fabulous wines. Unique among any river ship, this is the only “pop-up” bar on Europe’s rivers, easily lowered to navigate low bridges, and ideal for watching movies under the stars and the latest sports matches. Relax on a sun lounger or beneath a sweeping canopy as you take in breathtaking views of Europe’s most stunning rivers as you enjoy a libation served by our friendly staff. 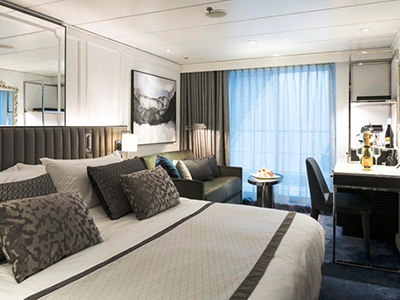 The dedicated spa found aboard Crystal Mozart features INSIDEOUT Beauty™ by DANIELE de WINTER of Monaco, a holistic philosophy and product line favored by celebrity clients and luxury lifestyle brands. Spa treatments and products combine in-depth knowledge of botanical ingredients with cutting-edge science to deliver health, beauty and anti-aging therapies. Comprehensive services range from warm-stone massage and tailor-made facial to detox and relaxation therapies. The Salon in the Crystal Life Spa offers a range of beauty services for ladies and gentlemen performed by trained professionals. Enjoy daily yoga and Pilates and one-on-one training in Crystal Mozart’s dedicated Fitness Center. Crystal Mozart also has her own Fitness Director. Crystal Mozart has a heated indoor pool, with a swim against the current feature, for relaxation.